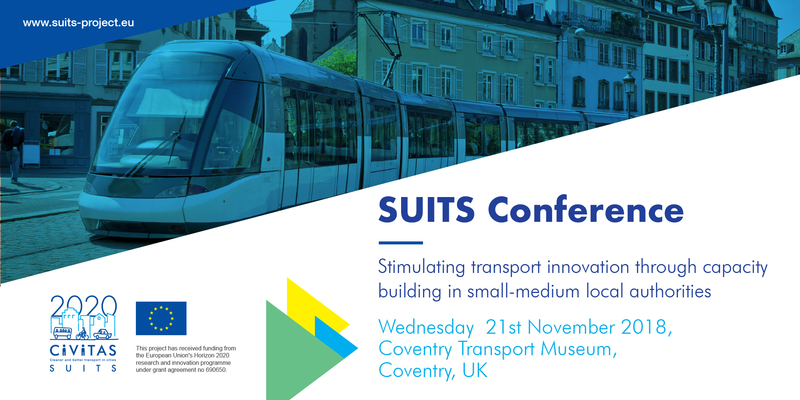 The SUITS Conference “Stimulating transport innovation through capacity building in small-medium local authorities” will take place on the 21st November 2018 from 09:00 to 17:30. at the Coventry Transport Museum in Coventry, UK. The world is changing and local authorities need to stay ahead the curve – though, it is harder for small- and medium-sized authorities to innovate,than their larger counterparts. Current research has shown that capacity gaps in small - and medium-sized local authorities’ knowledge and work practices exist; these may have arisen due to government and economic cutbacks, re-organisation, changing technology (e.g. open data), new business entrants, shifts in mobility, changing expectations of citizens and new directives (e.g. in terms of financing and procurement). Significantly, these gaps impact at individual, organisational and institutional levels, all of which need to be recognised in a far-reaching capacity building programme capable of making transport departments resilient and responsive to new challenges. The SUITS Consortium invites representatives from research institutions and universities, the larger scientific community, transport industry, transport service providers, cities representatives, local regional bodies, national and regional authorities, regulators, policy makers, civil society, media representatives, and public and private research & development (R&D) partners in the field of innovative transport to discuss the challenges associated with capacity building in small- and medium-sized cities. This should stimulate innovation in transport concepts and services through a citizen-oriented socio-economic approach.